After years of driving your car, your once-bright headlights will start looking a little worse for wear. Don’t just live with it, as foggy headlights can impact your visibility on the road at night or during bad weather, and that is never a risk you want to take. Rather than spend the extra money to get a new set of headlights, look at these various DIY headlight cleaner tips and tricks that work with items around the home. Many things can cause cloudy headlights. 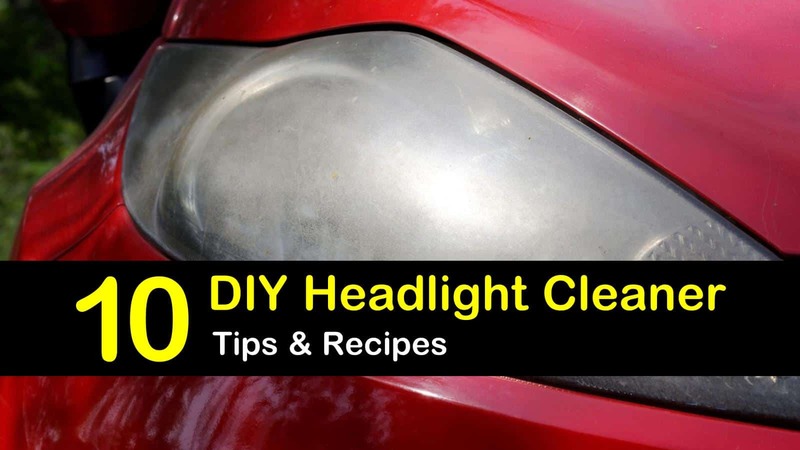 Whether it’s from the UV rays causing a gradual breakdown of the clear coat protective film resulting in oxidation or a build-up of mud and debris, learn about these home remedies for DIY headlight cleaner and work towards clean headlights. You’ll discover that these DIY headlight cleaner tips aren’t hard work, but it is a little different than a simple car wash, so be patient and follow these steps to have clean headlights before you know it. For an inexpensive and relatively simple option for easy headlight cleaning, find your household baking soda. All you need is a bowl with three tablespoons of baking soda and enough water to turn it into a paste. Rinse the headlights with warm water to get any debris off, like bugs or dust. You can use soapy water if you think you need a little extra help. With a sponge or a clean cloth, pick up some of your baking soda paste and coat the headlight. Using circular motions, scrub the paste over the headlight, rinse with warm water, and wipe dry with a clean cloth. Repeat this process, if necessary. If you need another excuse to try this trick, this baking soda paste is a great auto upholstery cleaner as well. If you need more than just baking soda, mix it with some white vinegar. Follow the recipe below for the appropriate proportions. Mix the ingredients in a bowl. Using a paper towel or soft cloth, use circular motions to wipe the mixture over the entire car headlight and rinse with plain water. Whenever you need a little touch-up, pour a mixture of water and vinegar in a spray bottle and give your headlights a quick spritz. To ensure that your DIY headlight cleaning job lasts a little longer, polish off your car headlight with some car wax or paste wax. The wax will act as a polishing compound and keep your headlight nice and shiny. Just as if you were doing a little at-home car wash, all you need for this homemade headlight lens cleaner is a bucket, some warm water, dish soap, and a sponge. Pour 2 or 3 tablespoons of dish soap into the bucket and fill it with warm water. Using your sponge, scrub your headlights. This one of those home remedies that you can make a regular chore, it’s that easy. For an added benefit, this is also the best way to clean the inside of a car windshield at home! If you need something a little more heavy-duty than just soap and water, try combining three of the most popular household cleaners: dish soap, white vinegar, and baking soda. Add a little extra punch to your headlight cleaning solution. Follow the previous step by washing your headlights with some warm, soapy water. Using a mixture of white vinegar and baking soda, scrub the headlight in circular motions. Rinse off the headlight with warm water. If you would rather not work with vinegar and baking soda, you can try a salty water and dish soap mixture. Mix the ingredients until the salt dissolves. Lightly scrub your headlights with a sponge dipped in the mixture. The salt adds the same abrasive quality as the baking soda while the dish soap breaks up grease and grime. Another homemade headlight lens cleaner sure to make those plastic lenses sparkly again is hiding in your bathroom: toothpaste! You don’t want to use a gel toothpaste, but toothpaste with added baking soda will provide an extra cleaning kick. Rinse or wipe off any loose dirt, dust, or bugs. Then, using your fingers, you want to spread the toothpaste evenly over the car headlight. You don’t want to be able to see the headlight lenses through the toothpaste. Take a spare, clean toothbrush and scrub the lens in small, circular motions. Rinse off the toothpaste with warm water. For an extra step, use some car wax or paste wax to polish the headlight and keep it cleaner longer. Another option for easy DIY headlight cleaning is to use a glass cleaner. Directly spray the glass cleaner onto the headlight and wipe clean with a paper towel or soft cloth. Glass cleaner is another excellent option for something you can add to your regular list of helpful cleaning supplies and is an easy preventive method for making sure you always have clean headlights. While bug spray with DEET can help clean your headlights, it is not the best option. A spritz of bug spray onto a paper towel and a quick wipe down followed by rinsing can help if you need to clean your headlights quickly, but the results tend not to be as long-lasting. Over time, the DEET will melt the protective film, which can be helpful if it is an old and cloudy film. However, the DEET can also dissolve the outer layers of the polycarbonate plastic if not thoroughly rinsed. Not only that, but DEET can potentially damage your paint (..). If you’ve tried these methods and they just haven’t given you the results you want, head to your local auto shop and pick out a DIY headlight restoration kit. These kits come filled with different products, tools, and instructions to guide you through the headlight restoration process. While they aren’t a homemade headlight cleaner, they can still be helpful. If nothing seems to be helping those plastic headlight covers, or you want to take your headlight cleaning to the next level into restoration, then this is the most intensive DIY headlight restoration method and is sure to make an impact. Just be aware, it will take some time to accomplish. Take your painter’s tape and tape a seal around your headlight and the paint. Wet the headlight with water. Wet the 400 grit sandpaper, and very lightly guide the sandpaper over the headlight in large, circular motions. Keep the surface wet at all times. Then, switch to horizontal movements, rinse the headlight, and wipe. Repeat with 600 grit sandpaper. Be sure to keep the surface wet and use very light pressure. Repeat this process with the 2000-3000 grit sandpaper. Wipe the headlight dry. Use a paper towel to wipe some rubbing alcohol over the headlight lenses. Use the cut open trash bags to cover the hood of your car. Use scissors to cut holes in front of the headlights. Then, use your painter’s tape to tape down the bags. Spray the clear coat over the headlights. Test the spray a few times so you can get used to how the spray bottle fires. You want the spray to be a relatively light, wide coverage, not pooling. Additionally, start your spray stream on the trash bag and then move over the headlight in one direction. Don’t rush this step. Apply three coats. Each coat will take time to dry, so look at the bottle for guidelines. After you apply the last coat, let the clear coat sit for 24 hours. The following day, apply the paste wax and buff when almost dry. Hopefully, you learned that it isn’t hard work to clean foggy headlights. These quick headlight cleaning tricks are an easy extra step to add to your at-home car repair and maintenance checklist. 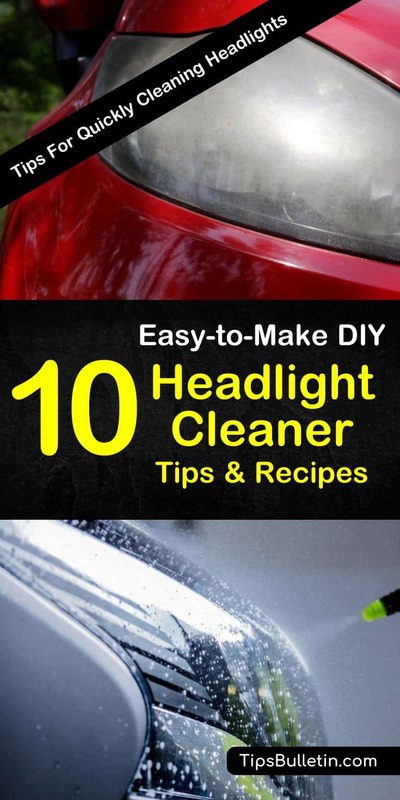 If you learned something from this homemade headlight cleaner article, then share these DIY car cleaning tips with family and friends on Facebook and Pinterest. Having clean headlights isn’t a luxury; it’s a safety necessity.